It’s been a while since the Cardinals scored six runs in a game — since Sept. 1, actually. True, they’ve scored five runs plenty of times, including yesterday and Friday (as well as Thursday and Wednesday, plus five other games) but never reached the “seriouser” number that gives all of you in St. Louis cheap drinks tomorrow until today’s 6-3 win over the Chicago Cubs. And it was in nine innings! Speaking of six, the Cardinals also have won that many of their past seven. Nice to be able to say that, isn’t it? Also nice to say: Kyle Lohse is now 16-3. 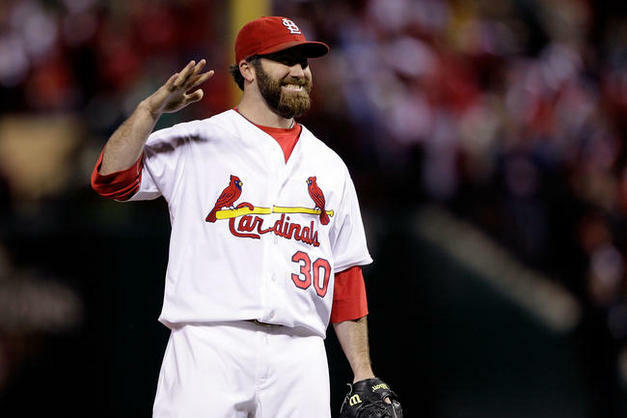 Jason Motte earned his National League-leading 40th save. Pete Kozma hit his first major league home run (and received the silent treatment as a way of acknowledging the occasion). And Kozma did get the home run ball back — though the real ball was not the one tossed onto the field. A quick-thinking Cardinals fan, Jeff Barabasz, caught the ball and immediately sat on it. He gave a decoy ball to his 13-year-old son, Matthew, who threw it back onto the field to appease the Wrigley Field faithful. They met Kozma after the game to return the real home run ball, posing for pictures with the 24-year-old. Kozma also drove in another run with a sac fly in the eighth and had a single. Allen Craig also had (yet) another good day at the plate: two singles, a double and two RBI. And all that run-scoring was welcome, given the Cardinals did leave nine runners on base. Lohse gave up all three runs, via a Wellington Castillo double, a wild pitch that allowed him to score and a home run to Alfonso Soriano. Lohse gave up five hits and struck out five. Following him were Edward Mujica and Mitchell Boggs, before Motte came in for the save. He did give up a lead-off single but got two grounders and then a called strike three to end the game. He is now the fourth Cards closer with 40 or more saves in a season, joining Bruce Sutter, Lee Smith and Jason Isringhausen. So the Cardinals maintain their 2 1/2 game lead in the wild card over the also victorious Brewers, with the Dodgers playing tonight. The Cards have nine games left. And they hit the road for Houston, with the final series as the Astros division rivals commencing tomorrow night. Lance Lynn and Fernando Abad are the starters, with game time at 7:05 p.m.